Trolleys hoists fully built in 316L stainless steel (including bearings). Manual travelling (CHPP) or chain travelling (CHPC). 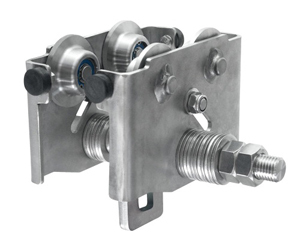 Beam width adjustable by stacking stainless steel spacers. Complete manufacturing 316L stainless steel corrosion resistant. Permanently greased bearings (no maintenance). Steering and handling chain in 316L stainless steel. Comes assembled with CE certificate and instructions.